Victoria West – the main road in the early morning. 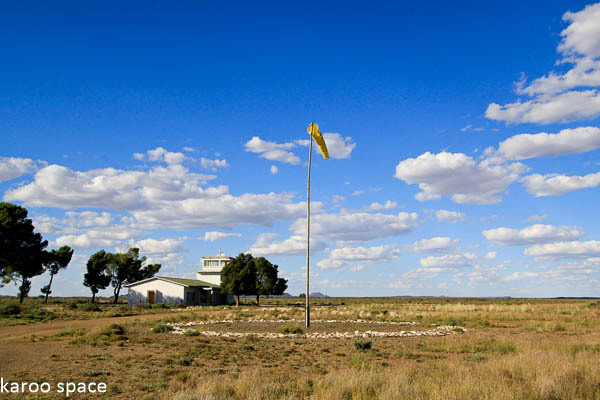 Victoria West stands at the crossroads of the N12, the R63 and Time itself. Today, we find ourselves under a whipping windsock a few kilometres outside a town that is blessed with a hundred-year biography written by the legendary historian, Eric Rosenthal. I bought it at a country book fair years ago and am now using it as a reference. It’s only 100 pages long, but One Hundred Years of Victoria West is a cracker. 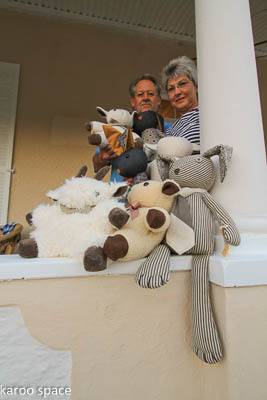 The Wool Boom brought the Karoo much-needed wealth. From what Eric tells me, and the info we gleaned from the excellent local historian Rochelle Vlok, I can time-travel back 66 years to the Wool Boom era, when a pound of the fluffy stuff got you an English pound in return. 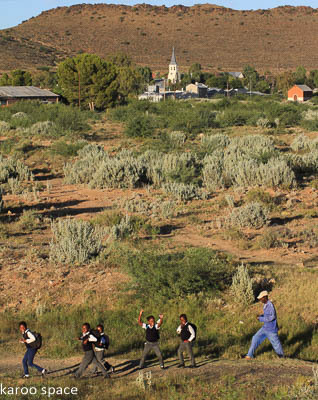 Farmers in the Karoo were suddenly richer than they’d ever been before. There was money to burn. Kids were being packed off to the leafy academia of Stellenbosch, Rolls Royces were all the rage and Mama had some serious shopping on her mind. And that sudden need for a second house on the old farmstead? 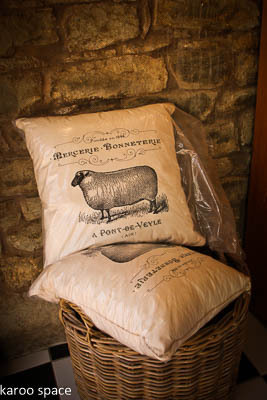 Wool Boom Bucks at work. The Victoria West Aerodrome (and don’t you just love that word?) had international status by now. Dakotas from Cape Town would re-fuel here on their way up to Jo’burg and, eventually, London. You could shake the dust off your pumps, gather up your skirts, march right up the stairs and ascend into the heavens from the Victoria West Aerodrome. There. I had to use that word again. In 1932 Imperial Airways, the fore-runner of the modern British Airways (also called BOAC somewhere along the timeline) recognised Victoria West as a refuelling aerodrome for their new London – Cape Town services. Old clippings will tell you that the bloke from Bester’s Garage in town had to occasionally climb up the little flagpole here beside us and replace the old windsock with a new one. A daunting task, by all accounts. 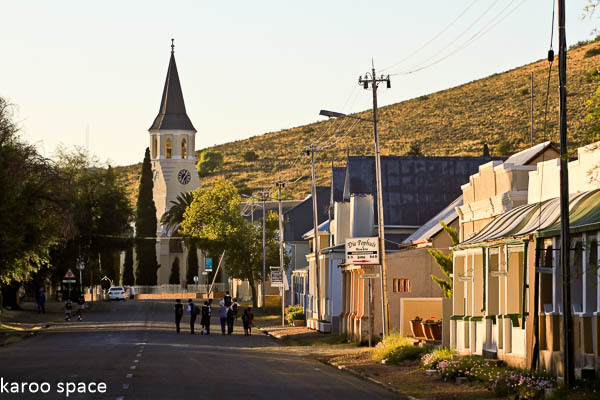 For an isolated little village in the middle of a Karoo nowhere (which is a serious nowhere), Victoria West punched well above its own weight. Children cross the town’s dry river bed on their way to school. The landmark tragedy of Victoria West, however, is the killer flood of February 27, 1871, which claimed the lives of 62 people. A bride died while trying on her wedding dress; whole families at dinner were swept away; most of a roomful of revellers at Quirk’s Hotel succumbed while a Mrs Jacobsohn and her children floated off to safety on a featherbed. Another hero of the flood was Johannes Buyskes, the postal rider who bore the mails from Cape Town to the diamond fields via Victoria West. He saved many lives that night. As a token of gratitude, some of the Victoria West women cut their hair and fashioned a fob-watch chain for him with the shorn locks. Church memories of the flood of 1871. 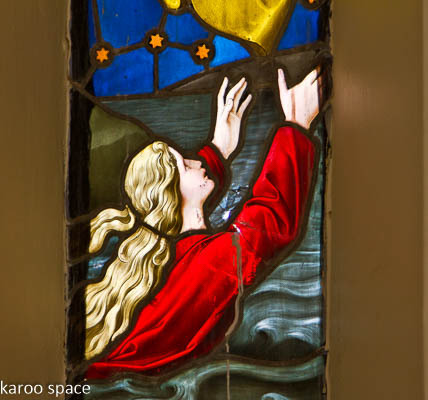 Visit the local Anglican church and you’ll see a couple of stained glass windows commemorating the flooding of Victoria West. The early 1870s brought big waters, but the next decade also saw many thousands of adventurers, prospectors, miners, ne’er do wells, remittance men, cutthroats, thieves, passing snake oil salesmen and some remarkably heroic characters drifting through Victoria West. Almost to a man, they were on their way up to the diamond fields of Kimberley and later, to the goldfields of Jo’burg. The ones who left The Diamond Way and made Vic West their home established hotels, a turf club, later a bioscope and, according to records, Pagel’s Circus even made a turn here. The Art Deco Victoria West Aerodrome. But back to the windsock and the Victoria West aerodrome. In 1953, with all that Wool Boom money around and a refreshed sense of belonging to the world at large, Vic West built new Art Deco airport buildings. This, say the records at the local museum, was about the time that flying passengers began to see elegant air hostesses on board, serving cocktails and such. And there was always lots of leg room. Oh, what times they must have been! But one thing hasn’t changed. There have never been airfield lights, so when there’s an emergency night landing everyone with a car is involved. You are expected to park on the side of the runway with your lights on so a safe landing could be made. The local doctor taking the local hearse for a spin. Dr Johan Lochner, the local GP and pilot, arrives at the airfield. He opens one of the hangars, revealing two gliders and a couple of classic old cars in various stages of repair. He also shows us his 1968 Cessna traildragger that he uses to fly up to nearby Vosburg, where he also has a small practice. This rather overworked country doctor’s therapy is flight. He glances upwards and his face lights up as he tells us about the fluffy clouds, slightly domed above and dark below. These are the perfect ones for flying and especially for gliding, as there are thermals among them. The doctor keeps gazing up at them with yearning in his eyes. Dinner at the Moonlight Manor Guest House. Back in town, we check in at the Moonlight Manor Guest House. Where is it? At the foot of Moonlight Hill, of course. Owners Schalk Nel and Sven Andersen came to Victoria West from Pretoria in early 2014 and fell in love with the old mansion and the promise of sundowners on its generous balcony. 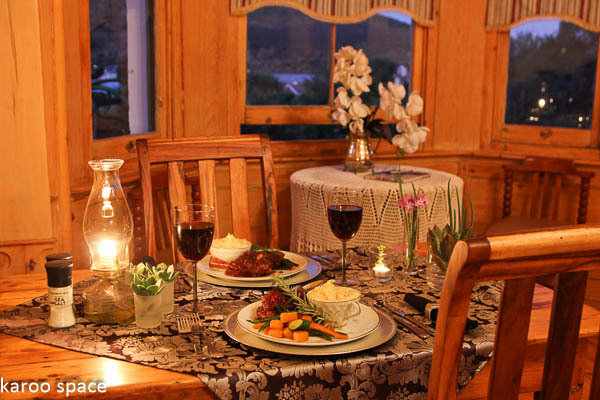 They bought the place and have turned it into one of the Karoo’s top boutique guest houses. The supper of goat’s cheese halloumi, springbok carpaccio and the slow-roasted lamb shank, followed by cinnamon ice cream with rooibos-infused poached fruit and custard, is simply superb. Well, there’s a first. I never thought I’d be eating something like cinnamon ice cream in Vic West. Nell Kingwill of the Karoo Deli. 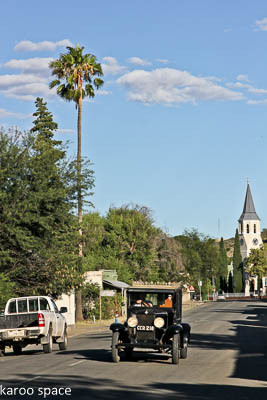 The next morning we’re at Kingwill’s Corner having coffee and speaks with the owner of Karoo Deli, Nell Kingwill. Nearby, serving customers, is Nell’s mom, Ouma Jessie, who has her own brand of rusks on sale in the shop. The place is a rich cave of crafts and decor, food from the region, hand-made teddy bears and, across the pool outside, some of the loveliest old enamel signs. 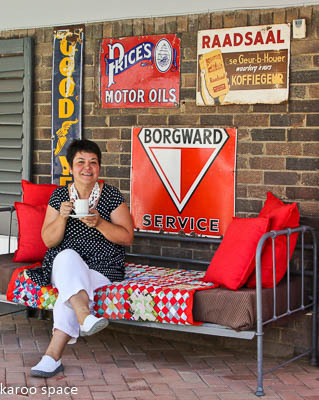 I photograph Nell sitting by her Raadsaal Koffie, Borgward Service, Prices Motor Oils and Goodyear Tyres signs. I offer her my life savings for them. She smiles, sips her coffee and demurs. She knows what journalists earn. The Karoo Deli looks after hungry travellers passing through and locals on the hunt for something special. Resident Victoria West artist Liza Wilson. 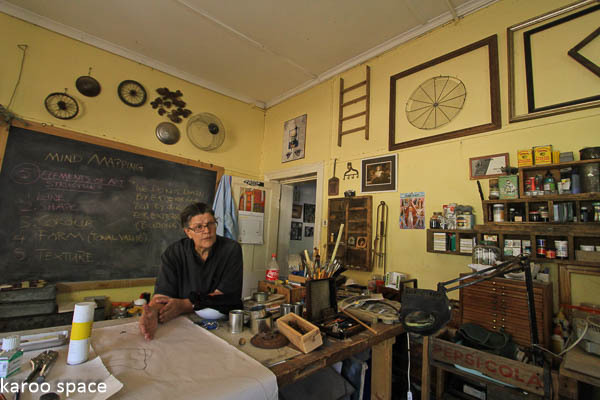 On our base-touching jaunt through town, we pop in at the home of Liza Wilson the artist. What was supposed to be a 30-minute visit turns into two hours. Liza is a true artist, a vocational artist, a professional who thinks all the time how to express her world in a true and cogent manner, how to, in one image or symbol, show the intrusion of man in the landscape of nature and beauty. One of the projects she has in mind involves in-spanning the local kids to help her create a series of giant artworks on the crest of Moonlight Hill. Louis and Contessa Kruger of the fluffy toys biz. But right now we are indulging our capacity for the experience of red wine and tasty treats on the stoep with the best view in town. It belongs to Louis and Contessa Kruger, who are also recent emigres from Gauteng. Heerlik in die verlede geleef terwyl ek hierdie artikel lees. My dae gaan terug na 1952 tot 1962. Baie op daardie lughawe gaan kyk hoe die vliegtuie land. Onthou Mannetjies Roux en n paar maats het een keer daar n vertoning kom lewer met die Harvard opleidings vliegtuie van die lugmag daardie tyd. Ek dink dit was 1961 (Republiekwording). Ons gesin het in Rotsvas gewoon (daar waar Mannetjies Roux gebly het terwyl hy skool gegaan het). Later het my ma die drank lisensie gehad vir die Marino Hotel wat later jare afgebrand het. Die oop stuk grond langs die Ko-op is nog stille getuie van die plek. Die Moonlight Manor Gastehuis het aan die Cloetes behoort en dit was ons klomp jonges se uithang plek. Barry Cloete, die jongste van die drie seuns, het altyd gesorg vir geleenthede om dinge te doen. Stout dinge. As ek reg kan onthou was daar n huis reg onderkant die straat wat langs sy huis van die berg af gekom het. Het eenkeer n trekker se binneband bo teen die kop losgelaat en die dinge het reguit padlangs dwarsoor Brankmanstraat gegaan, die muurtjie getref en n lelike duik in die geut van die huis gemaak. Verstaan dit is nog steeds daar. Sakkie (of Baba) soos my vriende my genoem het. No doubt Victoria West is as you experienced and described it. 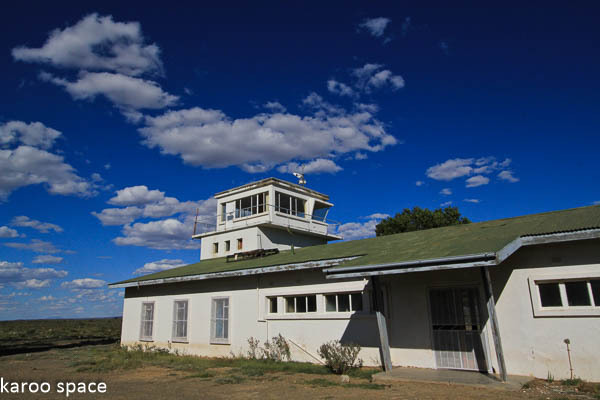 It could be a great stopover on the way to Kimberley and the north – but I doubt any one would stay there at present. I realise small towns have resource challenges and have other priorities – but to neglect an amenity as they have the caravan park is not intelligent. Spruce it up, advertise it and make some money from it! Thank you for the interesting article! I will send you some photos for your records. I have landed at that airfield where my folks were waiting with a picnic basket. It is truly amazing to find a mothballed airfield like that. It is so central to the whole country. Sadly one cannot refuel there and the closest is Beaufort West. Perhaps there lies an opportunity there for some entrepreneur in downtown Vic West to make it a B&B and refueling stop for travelling pilots. Jets cannot land there as the runway is not tarred. Thanks for this. 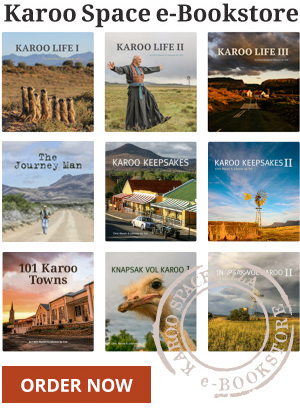 Victoria West is one of my favourite Karoo towns and I have enjoyed staying and eating there, clicking away and enjoying a coffee/meal at Karoo Deli. In Britstown on my N Cape road trip I met a Vic West resident over a cup of coffee at Trans Karoo! I will definitely be getting ‘One Hundred Years of Victoria West’. A year or 2 ago I got the Prof Wally Peters book which deals with the town’s architecture, so I look forward to Eric Rosenthal’s book. Thank you. Enjoyed that visit through your world. Wishing all the people mentioned, good health and success. No problem about leaving a reply! Love Vic West, have stayed there recently. Only thing, I could not find my way to the old museum, with its incredible artifacts. Porcelain dolls, superb old horse carriages, cars, oh everything. Last saw all that in the eighties. Sad to see Vic West being slowly left to decay, with folk who have kids moving out to the cities. And the lovely old Victorian houses sinking into disrepair. Me a half Afrikaner, half Pom, Transkeian and Freestater, so my heart is very deep in my land, well dug in. Living in Spain does not work for me. Wil sommer dadellik my 1974 Peugeot 404-avontuurwa pak en met die grondpad langs uit die Kaap Victoria-Wes toe ry! My friend Mario Muller lived there. He seemed quite happy and used to post pretty pictures of his ‘stoep’ and all the surrounds. Sadly, from what I gathered, he had died. No one could tell me more. One day I’d love to go over there and see his dorpie. Too many years ago I lived in Grahamstown and have during that time visited Victoria West. I, however, had no idea that Imperial Airways recognised the aerodrome there to be a re-fuelling stop – this was 6 years before I was born – so I learned something today!